purchase high quality mural painted or printed kerala kasavu settu saree from malabar shopping, we are providing 100% genuine high quality mural sarees. 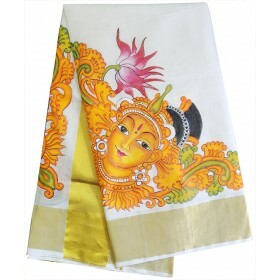 A Beautiful mural hand painted kasavu saree with 6" border with splendid Devi painting on pallu and .. It is a beautiful multi-colour combination of peacock feather mural print kerala kasavu settu saree ..
Gorgeous Kerala settu saree from MALABAR SHOPPING for woman’s to make them exotic in their tradition.. Celebrate theTraditional summer utsav at Malabarshopping utsav collection. Kerala kasavu saree speci..